Friday, November 2, the Uganda government announced it was going to withdraw its military forces from various regional UN-authorized peacekeeping efforts across Africa. The announcement is not a good omen for the efforts involved, most noticeably the sizable force considered the backbone of UN efforts to establish a legitimate government in Somalia. The BBC notes that the UN infuriated the government of Uganda when it published an experts' report last month accusing Uganda of arming Congolese rebels. The report said Rwanda and Uganda were both supplying weapons to the M23 rebels in the DR Congo. This long running conflict has forced some 500,000 from their homes since April, 2012. This M23 group - led by Bosco "Terminator" Ntaganda - who is wanted by the International Criminal Court (ICC) on war crimes charges - is merely the latest ascendance of constantly shifting and coalescing rebel groups in Eastern Democratic Republic of Congo. The region has never been brought under control of any government since the 1994 genocide in Rwanda. Rwanda's current leader, Paul Kagame(a Tutu) and Uganda, under the leadership of Yoweri Museveni, opposed the Hutu-led government and militias that slaughtered nearly a million Tutsis and moderate Hutus during that three month period in 1994, and during the past two decades Rwanda has continued to back armed groups in the east of DR Congo as a way to fight Hutu rebels who fled there after the genocide. The troubled eastern region of the Democratic Republic of Congo (DRC), with Rwanda and Uganda neighboring. The BBC article continues by quoting, Mr Mukasa, Uganda's Security Minister, told a news conference: "If our efforts are going to be misinterpreted and we are going to be maligned, we want to be in a good relationship with our neighbours. "Let's stop all these initiatives. We will concentrate on ourselves. Whoever wants to cause us trouble, they will find us at our home." Places where Uganda troops are stationed. The BBC notes that operations in Somalia, the Central African Republic and the Democratic Republic of Congo will be affected. Uganda provides the largest contingent to the UN-backed African Union mission in Somalia (Amisom) (7500 of the force's 16500 total). The Amisom force has helped the Somali government gain ground against Islamist militias. Analysts say a rapid withdrawal of Ugandan troops could threaten those gains. Ugandan troops are deployed in smaller numbers to an international mission to CAR and DR Congo to hunt down the remaining elements of the Lord's Resistance Army and its leader, Joseph Kony. The Horn of Africa - Somalia is the center of this large region of conflict - Islamists (Al Shabaab) and famine, piracy - with Ethiopian, Kenyan, Burundian, and Ugandan soldiers comprising the UN peacekeeping force establishing security in what is known as the prime example of a failed state. 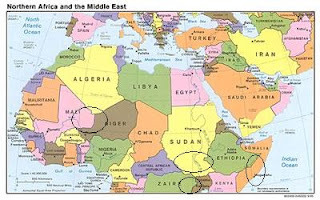 Sudan/South Sudan - the continuing battle of Islamist Sudan vs the black African South Sudan - the current point of conflict is over oil resources along the two country's border. Mali/Nigeria - both battling Islamists with Al Qaeda sympathies, along with corruption in their own government. Rwanda/Democratic Republic of Congo - the longest, deadliest, and most under-reported conflict on the continent.